We’ve all heard the phrase ‘fighting like cat and dog’ but that’s not always the case. Some cats and dogs are best friends, siblings even, and they love each other very much. However, it doesn’t always stay like that. 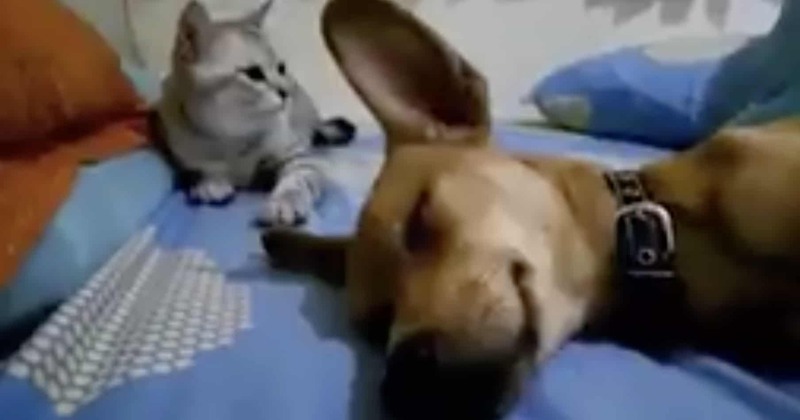 And after watching as this sleeping dog farts, we can see the cat’s frustration levels rise rapidly. I guess old habits die hard because it wasn’t too long before this cat started fighting with its canine companion. But they seemed so relaxed as they snuggle up to each other while having a kip… But good things don’t always last and it wasn’t long before they started scrapping again. The video footage starts off innocent enough. The cat and dog are both lying on the bed, both living in blissful harmony – but that was soon about to change. Out of nowhere, the dog lets out a huge fart which immediately pricked up the ears of the startled cat. The cat knew she had heard something, but it took her a few seconds to process quite what that ‘something’ was. The dog managed to keep snoozing even while letting out the loud accidental fart. But the cat couldn’t let the dog get away with it! That was a noise that just couldn’t be ignored. The cat even looks around the room to see if anybody else could believe the noise she had just heard. Seconds later, we think she managed to catch a waft of the smell. Without any warning, this feline fighter started throwing jabs left, right and center. Immediately, the dozy dog woke up, but he was pretty confused by what was going on. I guess that’s one way to teach your dog manners. If only this was acceptable in society, there would be a lot less inconsiderate farters in the world. We’re just so glad this owner managed to capture the hilarious footage.